With the heinous act of cowardice by the hateful white supremacist in New Zealand last week, I hesitate to ask this question. But it’s been coming up more and more. 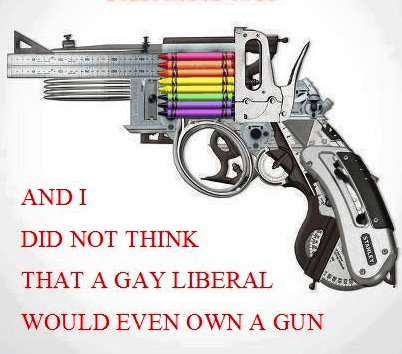 For over ten years now, Thaddeus has been saying that the amount of hate toward the LGBTQ community indicates that we should own guns and ammunition to protect ourselves if necessary. Only with the election of our POS POTUS did I ever consider that he might be right. As a far-left liberal, it seems antithetical to want to own a gun. I know that. Does owning one actually make me any safer? Could I actually bring myself to shoot another human being…even in self-defense? Would it be just for the house, or would I need a carry permit too? We don’t have children in the house, so we wouldn’t have to worry about a child accidentally finding a gun. How likely is it that I would ever have to use a gun? And is that chance worth the cost? Would my owning a gun support groups like the NRA in ways I’d prefer not too? There was just a great article about a gay-married couple in the heart of the South that decided to own a gun in the Huffington Post. I loved the analysis this author went through in obtaining and learning to use a gun. If nothing else, the article made me realize that I would definitely want to take shooting lessons if we decided to own a handgun. We do own two long-guns that Thaddeus inherited from his dad, but I don’t think I’ve ever actually even seen them. They came in cases and I don’t think I’ve ever seen them opened. I’d be interest to read what other LGBTQ folks think about this issue. I’ve been making progress on my various WIPs. And based on Ted’s and Barth’s comments on acronyms, I will settle on WIPs as the proper way to pluralize WIP. On the Biased Striped Stole, I have made just a bit of progress, so I won’t show a photo. 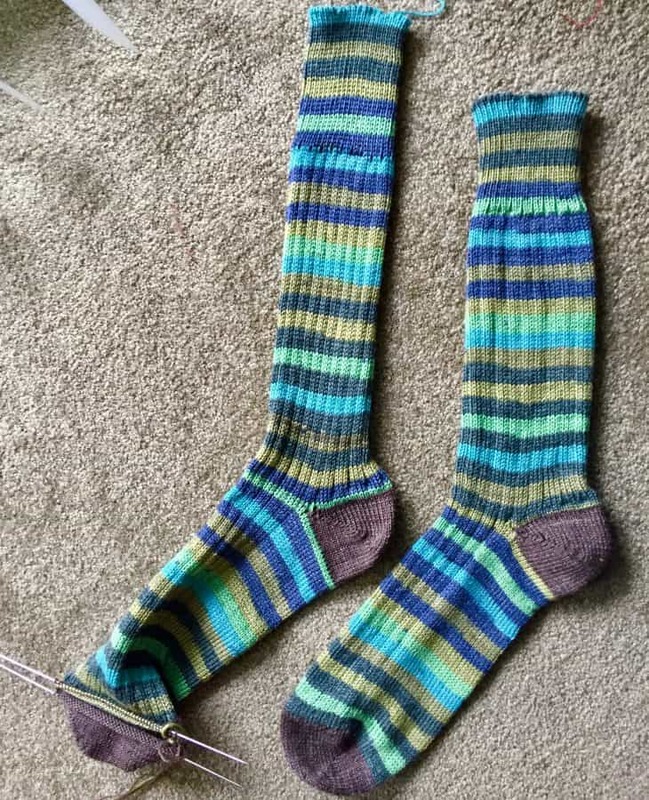 I did finish the second sock on the circular sock knitting machine. In fact, the second sock came off the machine with not one mistake that needed to be fixed post-cranking! I just had to graft the toe. 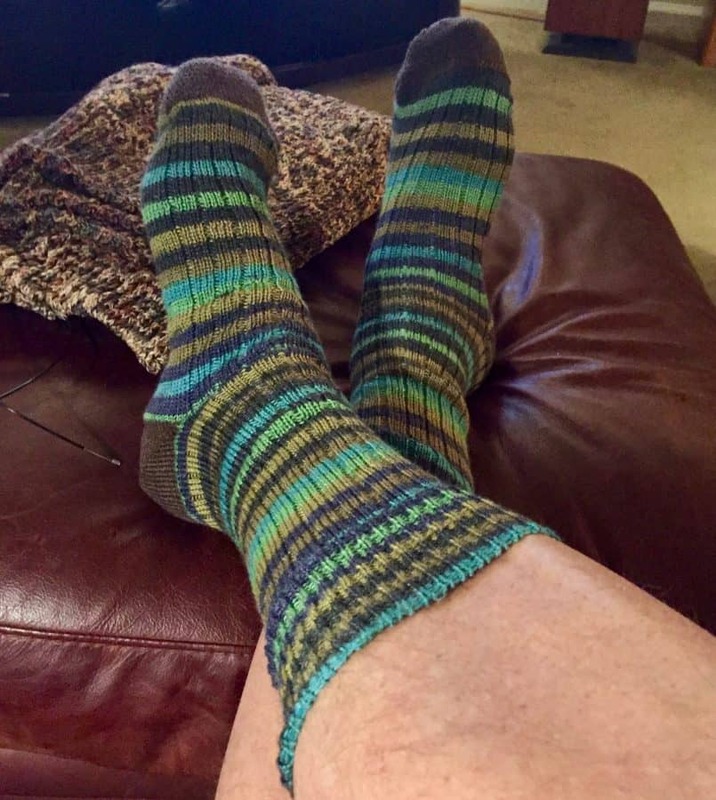 I am quite pleased with how these socks came out. Even as it warmed up this past weekend, I wore them around the house. 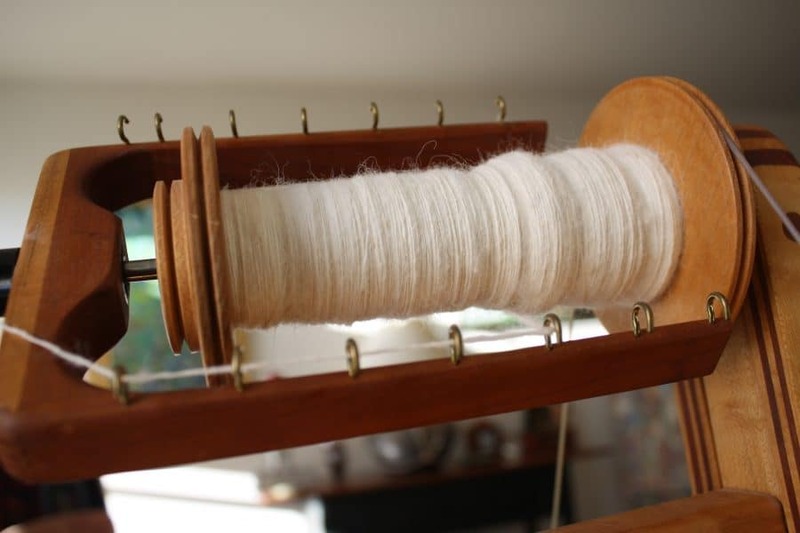 My spinning has progressed as well. I plan on spinning singles with the remainder of Tommy’s Preferred Blend and plying them up to make about twice as much yarn as the first hank (of about 500 yards). To think it’s come to that. The real answer is gun control not more guns. Easy to say I know. But the more people with guns the more likely guns will be used. When I read this I think. “Well, it’s happened. The apocalypse i’ve read about in Science fiction dystopian literature has arrived. When even innocent knitters need a gun civilization is over”. The real answer really is gun control. But that doesn’t appear to be coming any time soon. Is it pragmatic to own one until we get gun control? I really don’t know. I agree with you on that, Joe. I know, given my own mental health and family issues, I wouldn’t feel comfortable with a gun in the house. But having the skills to use one should the need (gods forbid) ever arise would be damn helpful, pardon the language. Here’s my observation from outside your country. The thing is, it’s not enough to own a gun. If you think you may have to use it, you have to know how to shoot it. And you have to practice and practice to develop some skills. And then you have to maintain those skills through regular practice. Otherwise you’re just an unskilled person with a gun, and likely better off without one. “Long time listener – first time caller” One thing you wrote in your post really resonated with me — does gun ownership support groups like the NRA who I don’t really want to support? And for me, that might be the one reason that rises to the top not to do anything more with guns than our family has thus far. We both come from sporting families where the annual deer hunt is a right of passage, so to have hunting rifles and shotguns passed down through the family “just is.” They are safely tucked away somewhere in the house. If our home was threatened, I’d have no idea what to do with a gun, but my spouse would — but that doesn’t mean it would be possible. Instead of spending $$ on additional guns, additional lessons, additional anything related to the gun industry, I’ll pay my security system bill each month and grab the ball bat on the other side of the door.